On Saturday afternoon, I took a jar of big creamy Prima flowers and layered them and sewed on buttons while I wanted a movie with the girls. My oldest always wants to know why I don’t ‘just watch tv’. Well, the truth is it’s hard for me to just sit still and not do ‘something‘. So, I watched a cute movie, completed about 15 or so big ole button blossoms and had some wonderful quality time with my family. This skinny notebooks came from my stash. 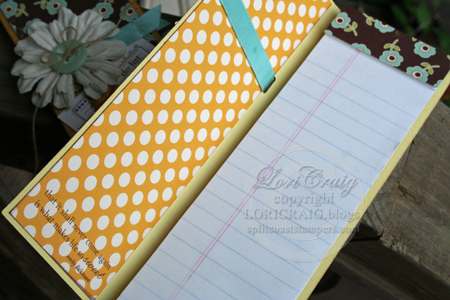 Like many of you, I buy the little legal pads at an office supply store and have them cut them down the middle for me. The store will cut the whole stack at one time with a nice crisp cut. 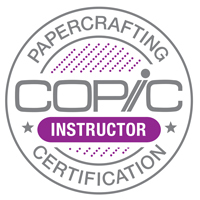 The covers dimensions are easy: 8″ tall by 5 5/8″ wide – score at 2 5/8″ and then flip and score at 2 5/8″ from the other side. That leaves you with a 3/8″ ditch for the width of the legal pad. I attach the notebooks to the covers with a sticky tape. They aren’t going anywhere. 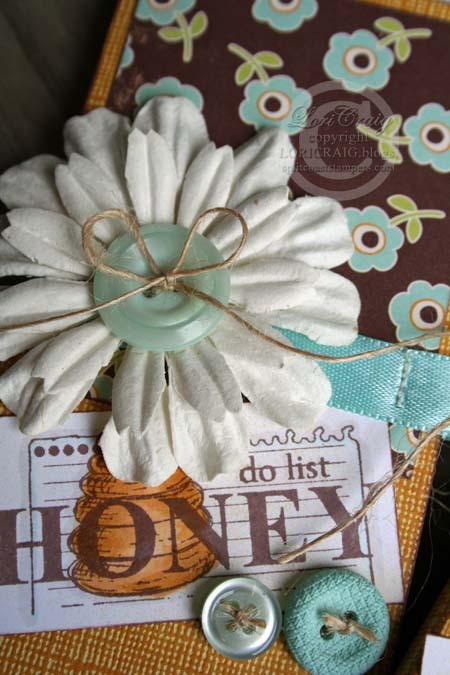 Mmm, paper buttoned blossoms and a lesson in fractions – all in one day. I know Mish makes these notebooks a lot and has included lots of tips and tricks over time to make the covers, so I won’t re-invent the wheel. Weekend Sketch Challenge time. Jenn handed out a darling sketch last night. I was excited to actually stamp with…wait for it…more than one color of ink pad. Can you believe it? Espresso and Latte ink. 🙂 I know – life on the wild side. One of the things I miss about doing design team work is chatting regularly with my friend, Julia. 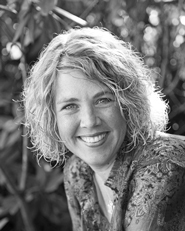 She’s just as busy as ever, and I love what she’s been doing with the Rummage Bin line from CHF. This set is the bees-knees. The sentiment is one of several from the set Ornamental Beauties, also Rummage Bin. 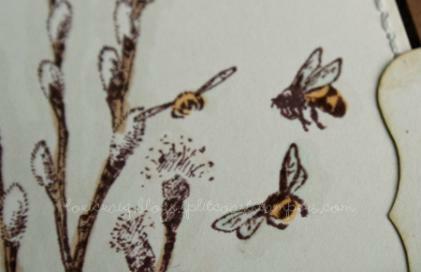 More subtle coloring and a little clear glaze accent on the bee bodies. More beautiful samples if you stop by and see Beate, Charmaine, Jenn and sweet Sharon. 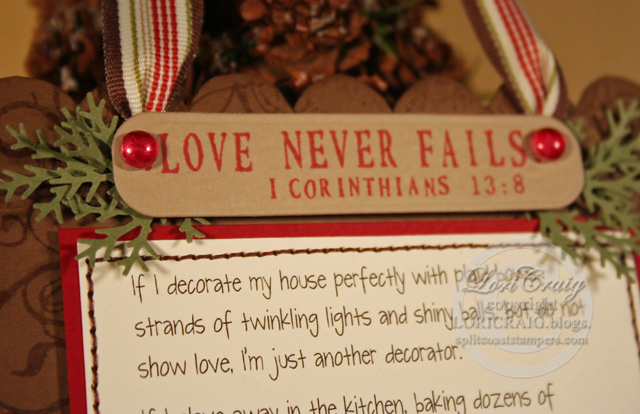 This month, I made a hanging ornament that will be displayed in my kitchen this month. I’m praying the reminder will keep me focused on Christ this Christmas. The full text and supplies are printed at the bottom of this post. I kept the details of the project to a minimum, because truthfully, I could not put hours and hours into this project and then tell you that I was really keeping the commitment, now could I? I’m not suggesting that I am throwing out all of our time-honored Christmas traditions and festivities, but I want this to be a Christmas filled with love and laughter, not stress and headaches. I don’t want my girls to grow up remembering that I was so stressed out about classroom parties or hectic shopping or unreasonable (self-imposed) expectations of platter after platter of pretty cookies (THAT WE END UP THROWING AWAY!). And, I don’t want to snap at my husband all month long and then put a smile on my face on the way out the door to a joyful Christmas get-together. I’m letting go of some my favorite, time-consuming cookie recipes in favor of boxed brownies and quality time with the girls. You’ll see tomorrow, that I’ve let go of has-to-be-perfect packaging. 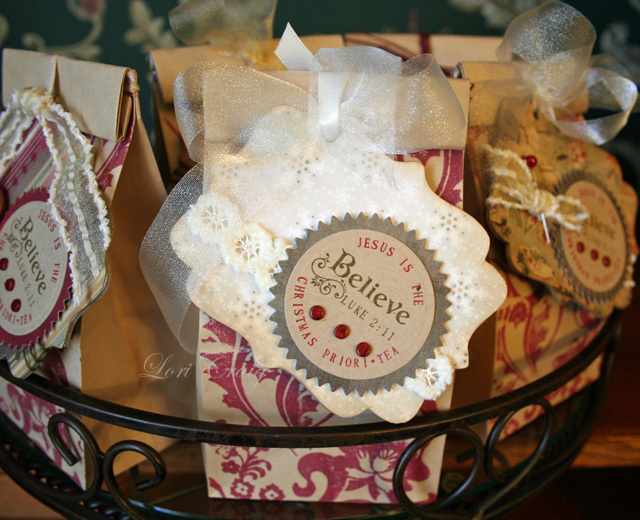 I’ve decided on more store-bought gifts with a quick tag accents and thoughtful notes. I’m having the girls wrap things for me. 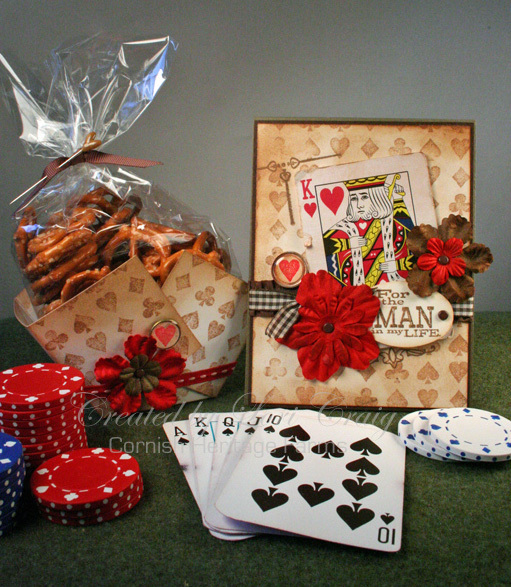 We have limited the social engagements that require fancy-schmancy finger foods or gift exchanges. In cases where I do need to take a finger food, I’ve purchased some different types of cheeses, and I’ll be putting those on a simple Christmas platter. It will be about the joy of getting together, not the grueling party prep. My brother’s family and Wes & I have agreed to not exchange gifts, and we are contributing what we would have spent on each other to a woman’s shelter in his community. It’s not too late for you to re-group and re-organize! I’m sure KNOW I’ll need the reminder daily until December 25th, but so long as I can remember to make it about showing love, I won’t fail. His Word is truth: Love never fails. and shiny balls, but do not show love, I’m just another decorator. do not show love, I’m just another cook. to charity, but do not show love, it profits me nothing. on Christ, I have missed the point. Love doesn’t yell at the kids to get out of the way, but is thankful they are there. giving to those who can’t. 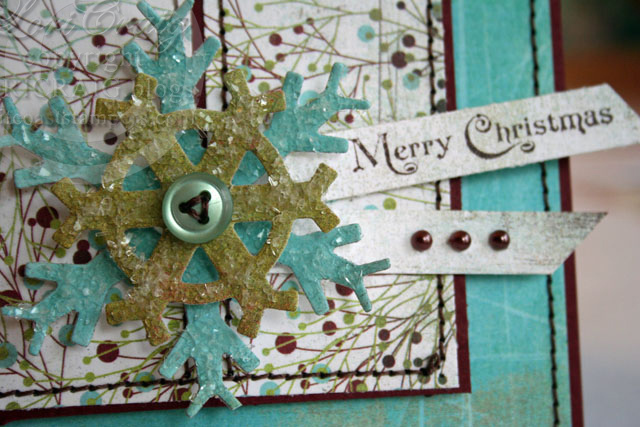 I’ve been in love with Anna‘s snowflakes just like the rest of blog-land. So I got the Spellbinders Snowflakes die and some of that cut glass glitter and went to town. I grabbed the Splitcoaststampers sketch from Roxie this morning and here’s where I ended up. This made my week! 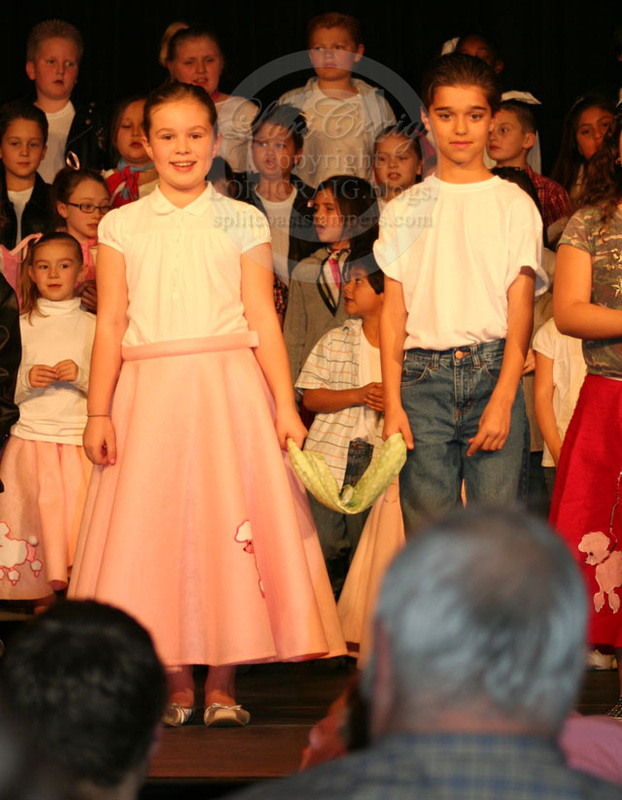 Here’s my darling daughter at her school program last night. It was a Rock and Roll Review put on by the 3rd grade class. It was fabulous. 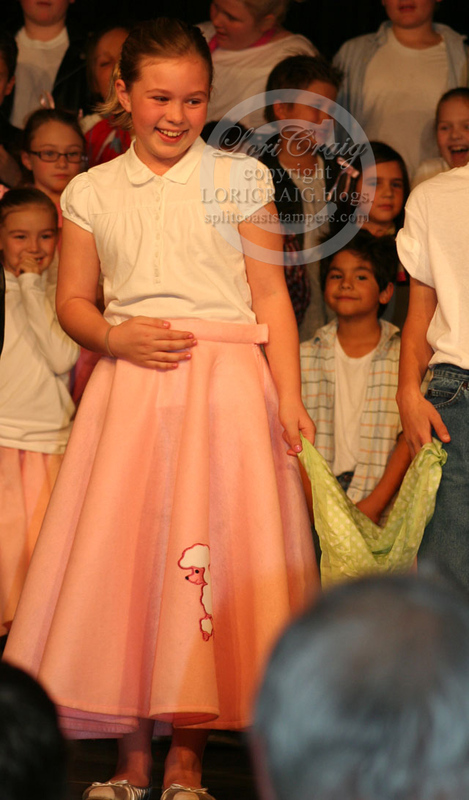 She sure was proud of that poodle skirt – thanks, grandma! Here she is doing ‘the stroll’. 🙂 I’ve got a full plate today, so I’m gonna stroll myself. Have a great day! Several years ago, a friend gave me a baby food jar with a spiced tea mix and a sentiment about making Jesus my Priority. The idea was that we would make time for Him in our busy daily lives. I kept the empty jar, label facing out on my spice shelf long after the tea was gone. 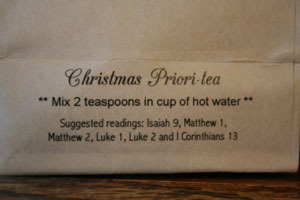 I was thinking about all of the special gifts that I need around Christmas, and thought this tea would be perfect for a few. Isn’t this the time of year that we get most lost in the shuffle and bustle and forget a few of our priorities? I used the recipe that Sharon shared last year HERE, but if you google ‘spiced orange tea recipe’ – you’re sure to find a recipe that suits your fancy. There are many. I put my tea mix in cello bags and then inside new kraft coffee bags. 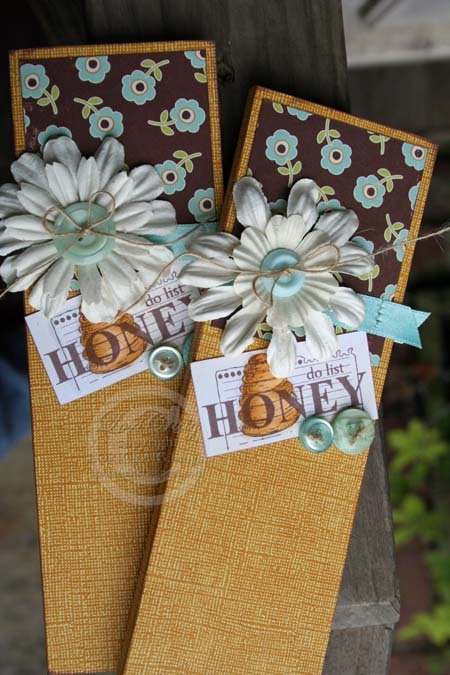 The coffee bags were stamped with the Fiery Floral Scrapblock from Cornish Heritage Farms. I used a Cranberry Pigment Ink Pad from Ranger. It gave such a rich, deep look. 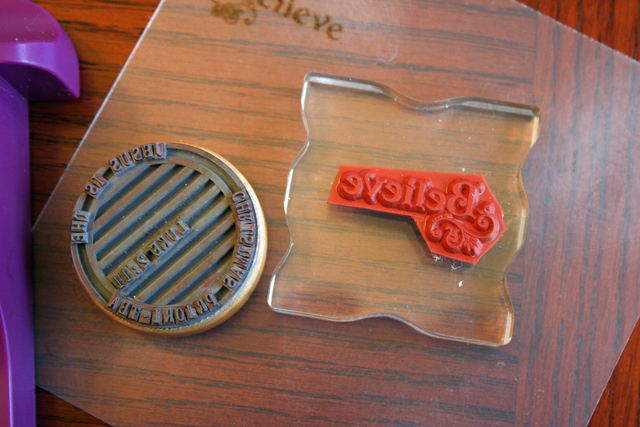 Next, I stamped the sentiment with my JustRite Stampers, C41 Stamper and mini alphabet. Pssst, they are having a ‘buy one, get one free’ sale thru 11/30/08. Check it out HERE. The ‘Believe’ is a Rummage Bin sentiment that I love, created by the beautiful Lesley Langdon for Cornish Heritage Farms. It took a few minutes, so stamp several when you get it all set up! 😉 Don’t forget your Stamp-a-ma-jig. I used Cranberry and Pesto Adirondack Dye Ink on the labels. It’s great that Ranger offers the colors in both dye and pigment ink. Make coordination a breeze with the proper ink for different mediums. Speaking of coordinating, the brads were colored with Copic Marker R59, it matches perfectly. I cut the labels and the matted frames with Nestabilities. 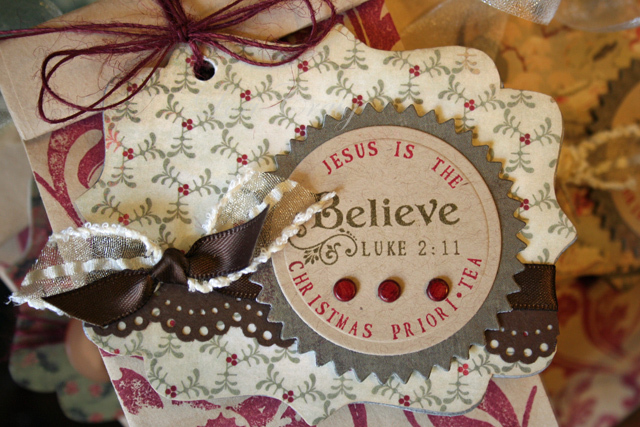 The tags are MayaRoad chipboard covered with Basic Grey Wassail patterned paper. 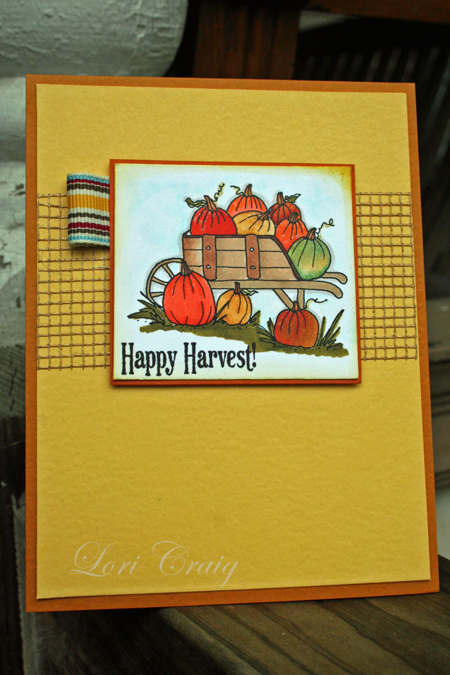 I used Mod Podge to adhere the paper and dimensional dots to pop up the die-cut labels. Various ribbons from Webster’s Pages, Beaux Regards and May Arts (all available from the fabulous Cindy Lyles at StarLitStudio) finish it off. I’ve had a wonderful weekend full of crafting and getting ready for Christmas. 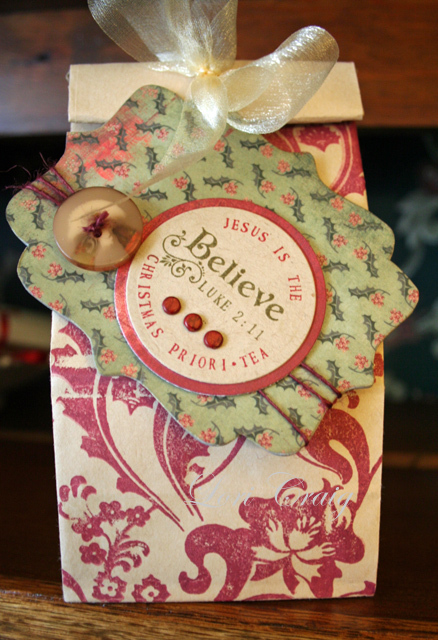 More tea packaging, gift and Christmas ideas to follow this week. What’s up tomorrow? A challenge issued by Jami. She’s the bossy one! <wink> So, I wouldn’t dream of not following orders. See you in the morning. 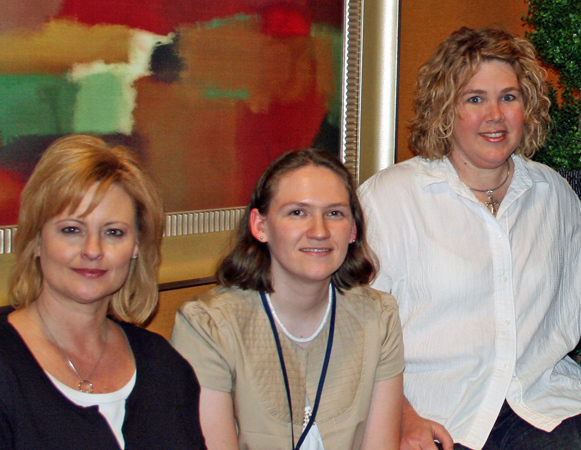 It was so much fun to spend the weekend with my friends, Sharon Harnist and Marianne Walker, right here in my hometown of Kansas City. It was like having a private color coach right at my disposal for 3 days. How lucky am I? Here’s a quick card that I put together this morning. I came home with plenty of adorable Lockhart images to color in the next few weeks. 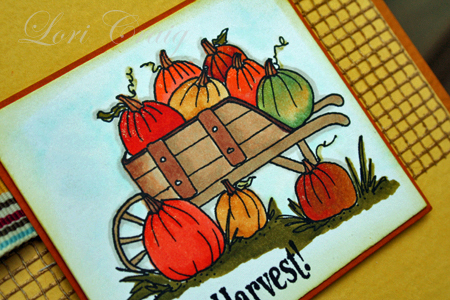 This Pumpkins in Wheelbarrow was colored with a range of Y and YR colors and then accented with a clear Spica glitter pen. The sentiment is from All Things Fall (CHF). Both of these stamps are available from Ellen Hutson, LLC. This is the 3 of us after virtually no sleep, lots of coloring and a ton of laughs. Special thanks to my sweet husband who let me get away for a few days despite the fact that it’s ‘bow season’ ~ and I’m not talking ribbon. 🙂 See you tomorrow! 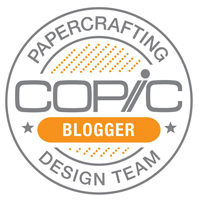 Scroll down to yesterday’s post for WCMD Blog Candy from Paper Crafts, Lizzie Anne and Cornish Heritage Farms! So quick this morning – it’s Homecoming Week, and any of you in small town America know that’s an entire small town deal! I’ve got to be up on the ‘courthouse square’ in 10 minutes to watch my first grader in the ‘NO TO DRUGS’ mascot parade! Good times! This is a new Rummage Bin (love Lesley Langdon!) 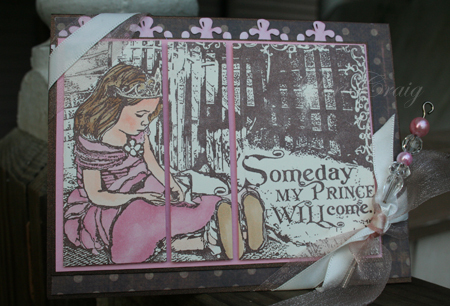 stamp, Someday My Prince Will Come from Cornish Heritage Farms. I thought I’d cut it all up for Beate’s cute & crazy sketch today. Sometimes the things I think will be the easiest end up taking the most time, KWIM? I’ve colored the princess with Copic Markers and her crown with a Sukura Stardust Pen – wish I could find my Spica Glitter Pens, but they ran away from home during the ‘great organization’ three weeks ago. The organizing still isn’t done, and the pens haven’t come back yet. 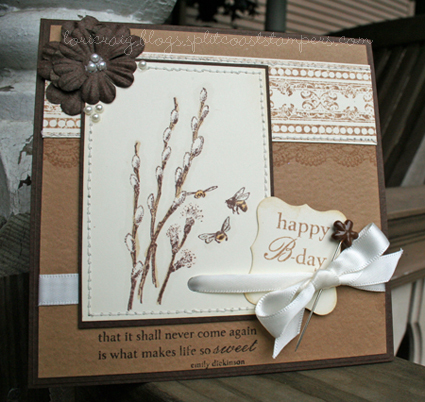 🙁 Ribbons, stick pin and beads and some die-cut trim from Prima accent the card. I posted last week that I had a special Christmas project to share. 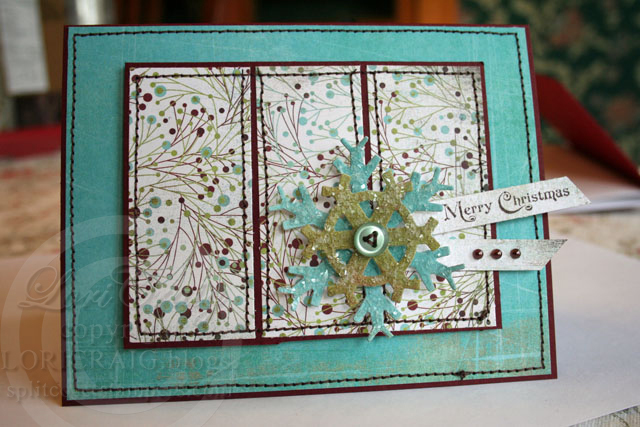 This is one of three projects that I have featured in the newest Paper Crafts special publication, Holiday Crafts & More. You can pick up your copy at Barnes & Noble, Michaels or probably you local scrapbook store that carries periodicals. 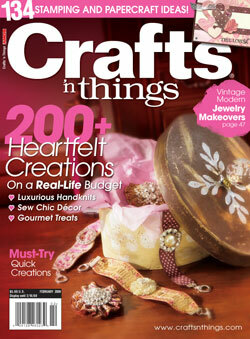 It is filled with wonderful holiday sentiments and gift ideas. Last year around Thanksgiving, I picked up this tiny little nativity scene at Hobby Lobby. It was the best $2.99 I spent last year. 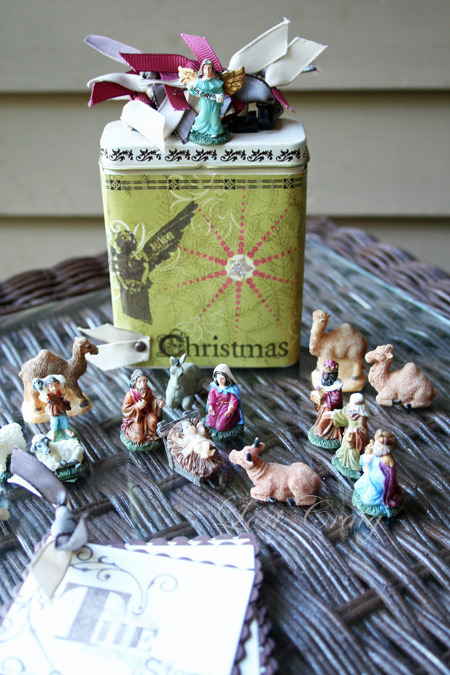 I say ‘little nativity’ because all of the pieces fit in this band aid tin from Provo Craft. I altered my tin and typed up a few verses to explain the Christmas story. I love how it all tucks away so nice and neat. This would be a wonderful gift for a Sunday School teacher, and I see many, many uses in children’s ministry areas. I know that our set will see a lot of action this Christmas season, and it’s one of those things I’ll treasure always. See you tomorrow with a color challenge creation! Thanks for stopping by!